As a kid I dreamt of a life inspired by Famous five camping in the countryside or living in a Treehouse. When I grew up I realized how geographical barriers won over dreamy travel plans. A date with the penguins in Antarctica was exactly not as feasible as geography books portrayed and adventures in Amazon jungles were easy to dream about but hard to live in reality. A few brushes further with reality led to the realization that dream destinations meant money. Dream destinations mean Vitamin M! It meant sound financial planning, meticulous saving, wise financial planning and prudent spending. Travel is beautiful and even more when you save up for it! 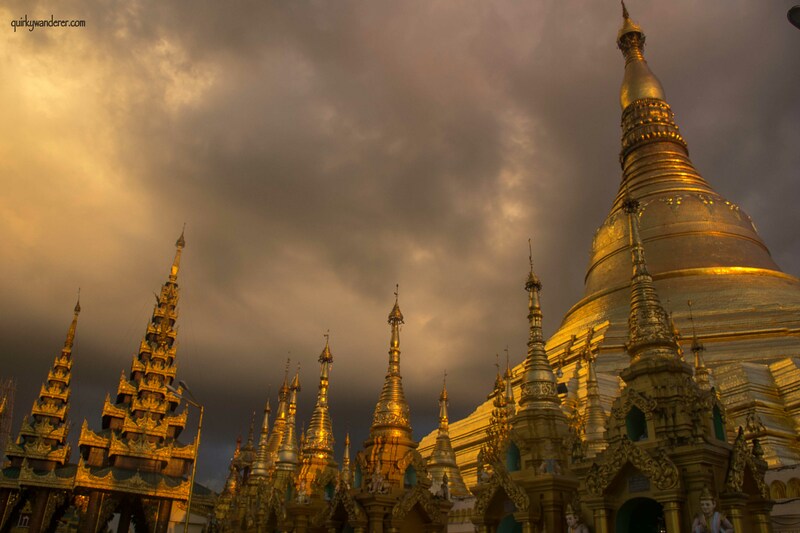 My Myanmar trip was one such dream trip where pennies were saved, expenditure was curtailed and once it became a reality, there was a euphoria like none other! Every phase of the trip was broken down to T from planning to research, to travel insurance to fretting about vegetarian food. When I started earning, along with mandatory and essential financial decisions, a travel fund was created too. All tiny earnings from travel were pooled into the fund for future travels. A person who knew zilch about credit cards, financial plans and premium calculators was now just for the sake of ticking off bucket list destinations learning to manage Vitamin M (money) and how! My first encounter with a Tiger and my first trip sponsored by myself! First trip with own money! Everyone thinks travel blogging is all about sponsored press trips and “free” travel, but alas, many of the blogging fraternity will travel anyway! While press trips may be an economical way to see the world, they aren’t the ‘only’ way to travel. In this post, 10 travel bloggers from across the world share their tips, secrets and advise to travel smart and manage your finances in a way that your bucket list is never deprived of Vitamin M! I manage my finances while travelling through travel budget apps. Each new country I visit, I input my budget and length of time into the app. This, in turn, makes me cut down on the needless stuff from my travels and starts saving money, so I can travel for longer. The app is compares my daily spend to my daily budget, so it tells me immediately if I am going over, but then takes into account my whole trip budget also. Another great feature is being able to put items into categories. This means at the end of a country/trip I can see where the majority of my money went, and if I am travelling for longer term, then it makes me reconsider how to spend my money. The app displays this information in graphs, so it’s very easy to see a breakdown. The app also works offline, so no data connection is needed and backs up every time you get onto wifi. Try to book everything online from your own country to conserve on foreign exchange. No travel dream is unachievable, all it takes is a little bit of investment planning. Agreeing with them, I feel ULIPs are a great option for people looking for investments and as well as insurance. In a Unit Linked Insurance Plan, one gets market linked returns. This means you get access to a variety of options like bonds, mutual funds, stocks and the flexibility to manage funds and decide the risk level depending on individual financial goals. Plus, after a 5-year lock in period, depending on the premiums paid and sum insured, you can withdraw partially from your corpus. This way, you can plan for your travels early on, and finance them too. One of the best ways I’ve found to fund my journeys is to open a separate savings account just for travel. I’ve had one for years, and it works great because it fosters a positive habit, accrues quickly, and goes towards something I’m passionate about. Every time I’m paid, I immediately transfer some amount (doesn’t have to be a lot), into the travel account, thereby removing, from the get-go, the money I use for my day-to-day expenses. It’s amazing how quickly the dollars add up. And the best part is, you don’t feel guilty about using the cash for some wonderful adventure. Chances are that you’ll be using some form of internet banking while you’re travelling. I do. I usually log into several accounts multiple times a week over public Wi-Fi. I won’t labour on about the risks of data, money and identity theft because I accept them, but here’s what I do to minimise them. Avoid using public or shared computers to connect to your bank. The risk of credentials being compromised is much higher than using your own device. When using your own device on a public WiFi connection use a VPN to encrypt your data between you and your bank. It’s preferable to use cell phone data rather than a public wifi connection but still use a VPN too. Lock your electronic devices up in a portable safe – when you’re not using them and secure it to an immovable object! I don’t know how we would manage our finances on the road without access to internet banking. We take these simple precautions to minimise risk and keep travelling! We love to travel, but we also love having a base. Teaching abroad gives us the chance to immerse ourselves in a place and experience it more deeply. Teaching jobs in Asia provide an adequate income, and some contracts include benefits like a housing stipend, airfare and medical insurance. Combined with the low cost of living in Asia, we are able to live well and save much more than we could when we lived in our hometown in southern California. Living in one country has also given us the chance to write about it in depth on our blog and work with local businesses. During school holidays and between teaching contracts we make it a point to travel. The nice thing about teaching in Asia is that jobs become available throughout the year, so when we’re running low on funds we can look for new teaching jobs anytime. Teaching abroad has been our ticket to experiencing more of the world, and blogging has only expanded our opportunities to travel and earn money. This is what works for us! I find the best prices by researching and comparing prices on multiple online marketplaces and websites. Various platforms offer exclusive promotions that can offer you a discount off the usual price. The same goes for booking flights, as each airline offer their own promotions, on top of the ones offered by flight aggregators. Expensive hotels can be booked with wise planning. In picture: Myanmar Treasure resort, Inle. There are also lifestyle apps that can help promote local businesses, in exchange for a substantial discount. For example, there are paid voucher subscriptions that offer 1-for-1 meals, hotel stays and ticket prices in different cities around the world. If you’re intending to visit a place listed in these magazines, you would have already saved more than the price of the subscription! 2018 will be our travel year and in order to realize this dream we made our family sabbatical the number one priority of all our efforts. We also took a very beaten but proven path and created a good old budget and saving plan. Prioritising travel needs and budgets to ensure a good trip. After identifying a fixed amount that would go straight to our savings on pay day, we became quite ambitious in increasing this sum. We cancelled gym memberships, downgraded phone contracts and said bye to fashion items. But we did not only cut drastically on our spendings, we actively put every cent aside that we saved along the way – for example a 20% reduction on something we would have bought anyway? That 20% would go to our travel piggy bank where it slowly but surely adds up. As we declared travel as our highest priority, we have to do comprises regarding our travel style. We will always choose the self catering lodging facilities or housekeeping over a hotel, public transportation over rental cars and a day at the beach over a theme park. Identifying priorities and having a clear overview over finances definitely helps both – to save up money before and not to overspend during the trip. Days at beaches over theme parks! In picture: Me at Andamans! When it comes to finances, my wife and I are on the same page. We both want this journey to continue and know how important a sound budget is to that goal. Because of that shared vision, we’ve developed a budget that works for our own situation.Our budget is broken down by month and has 2 broad categories: home and trip. Both broad categories are then broken down into 5 smaller ones: accommodation, travel, groceries, entertainment, and miscellaneous. Trip budgets and Home budgets help to plan well. We calculate our monthly “home” budget by figuring out how much we would spend in a month back home in our regular life, take that number (based on groceries, entertainment, rent, misc) and then adjust the number higher or lower based on the cost of living in our “home” city. For example, if Melbourne is 17% more expensive to live in than our home town of Winona, Minnesota, we bump up the budget 17%. You can find out more about the cost of living in cities online. From there, we can adjust it for the next month if need be. Otherwise we are very loyal to our budget. And when it comes to tracking our numbers, we save every receipt to enter it to our spreadsheet. We take the amount of a given expenditure, convert it from local currency to USD, and then add it manually to our spreadsheet. Once it’s entered the spreadsheet will adjust and calculate how much of our budget we’ve spend and how much is left. So far this system has been working really well for us. One of the ways that I manage expenses on the road is by keeping all of my receipts and doing a post-trip debrief at the end of the trip. Periodically I detail my expenses in a spreadsheet. Holding onto receipts also serves a dual purpose for reconciling (matching up) charges to credit card statements and since I’m a travel blogger this meticulous record keeping is important come tax time. Also, if there’s any discrepancy, I can address it immediately. Post-trip debriefs are great for evaluating your spending and scaling back if need be. Or maybe you’ll realize that you have more money to spend which is always fun! To travel and travel often according to me is an act. The art of saving money and knowing how to maximize your available resources. My travels are always self-sponsored, I find it by working extra hours tutoring students after my regular work hours. I have decluttered my life completely, gave away things that I don’t need and stopped buying items that are not an absolute necessity. Before I purchase anything I stop for a minute and ask myself ‘Do I really need this?’ and trust me 80% of times I do not buy it. Also, I have stopped meeting friends at expensive cafes, now all the get-togethers happen at my house. Being environmentally conscious also helps in reducing expenses, I carpool all thanks to Uber, save cooking gas, switch off electricity, refill bottle instead of buying packaged water. Public transportation in India : the Trains! While travelling I make sure to use public transport, make my own breakfast, stay at cheaper accommodations and eat local. If you plan right and control your urge to splurge, you will not only save money but also have a meaningful journey. Putting it in words, sound financial planning is essential to realise your grand travel goals and Aegon Life Insurance Company Limited*, One of the world’s leading financial services organisations, can provide customised advice, bringing transparent solutions to customers, especially travellers to prioritise their needs to explore the world, and travellers need to wisely choose the best option suited to their needs. Aegon Life Insurance Company Limited launched its pan-India operations in July 2008 with a vision to be the most recommended new age life insurance Company. The fulfilment of this vision is based on having a complete product suite, superior technology, providing customized advice and enhancing the overall customer experience. This joint venture adopts a local approach with the power of global expertise to facilitate a direct to customer approach, leveraging digital platforms. Aegon, one of the world’s leading financial services organizations, providing life insurance, pensions and asset management and Bennett, Coleman & Company, India’s leading media conglomerate, have come together to launch Aegon Life Insurance. Traveling wise means wise financial decisions! Disclaimer: This post is sponsored by Aegon Life Insurance. The views of all the travel bloggers including me are their own. Wow what an eye-opener this is! Travel blogging is not just all glory and fun, is it? What a lot of valuable inputs from so many fabulous travel bloggers, all compiled in this one handy post! Also thanks for introducing us to so many famous travel bloggers! Yes, vit M is an important consideration. Thanks Kala! 🙂 You have traveled with me and you know hunky dory it is 😀 hehe Thanks for reading:) so glad you liked it! All we need to know about travel blogging. A valuable post indeed. These are some great money saving tips and an interesting look at how others save and plan. When I was younger I focused on making as much money as possible, by picking up extra shifts, working more hours, trying to get more commissions from my sales job. About 14 years ago I started working in tourism in Alaska where I work about 8 months a year and don’t spend hardly any money at all, then have 4 months of no work. In the United States, working seasonal jobs in the tourism industry is a good way to save money and then have the time off to travel. Great post! Thanks for sharing all those valuable advice. I do prepare my travel months before as most of my travel is combined with scuba diving as well. Sometimes the cost of the diving package itself could break our piggy bank 😀 so we do need to save money and do lots of research to get the best deal. Too much info from experienced travellers in a single post and something that is bookmark-worthy. Thanks for this Divsi. A lot of new perspectives come out from this. Glad that you wrote this.